Please help me welcome author Sharon Cullen to A Buckeye Girl Reads Reads today. 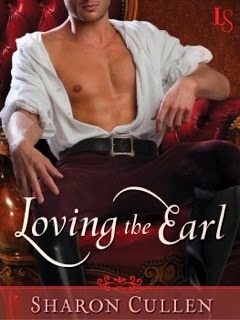 She's here today talking about her newest historical romance, Loving The Earl. In Sharon Cullen’s sizzling novel of scandal and seduction, a headstrong beauty is pursued across Europe by London’s most notorious rake. Having vowed never to wed again, widowed viscountess Claire Hartford is about to do the unthinkable: travel unaccompanied across the continent in search of a lover. Her adventure begins sooner than expected, when she meets a magnificent cloaked stranger on her ship’s gangplank. He is Lord Blythe, a man whispered about in London’s ballrooms and drawing rooms, a scandalous rogue hell-bent on seduction. Nathan Ferguson curses the day he agreed to look out for his best friend’s wayward sister. The charismatic earl is traveling to Paris to uncover the truth behind his father’s death, but his desire for Claire threatens to be his undoing. From France to Italy, on a journey of passionate discovery and danger, Nathan is honor-bound to protect her—from himself most of all. What can he offer Claire? Only love, as he sets out to prove to the woman of his dreams that she belongs to him—body, heart, and soul. 2. There are many “passes” to get through the Swiss Alps. I had my hero and heroine travel the Great St. Bernard Pass which is the third highest track pass in the mountains—and the most treacherous in that time period. 3. The most famous St. Bernard dog was named Barry and he saved between 40-100 lives in the pass. 8. In the 18th century there were 3,000 drinking establishments in Paris. WOW! After earning a degree in journalism from Ohio University Sharon found that the stories inside her head were more interesting than what was going on in the world around her. Yet, it wasn't until years later that she decided to pursue her secret dream of writing a romance novel. Since then she's been published in romantic suspense, paranormal romance and contemporary romance. The Notorious Lady Anne is her first historical romance. Sharon's other job descriptions include chauffer, laundress, cook and mediator to her three very busy kids, her husband and two dogs. She lives in southwest Ohio with her brood although her dream is to someday retire to St. Maarten and live on the beach.